Although you get the sense early on in the national touring production of Cinderella, currently playing at LA’s Ahmanson Theatre, that this version of the popular fairy tale isn’t quite the one you grew up with, this point is really driven home at the end of act one. As Cinderella flees the ball at midnight, she of course loses her shoe—but she dashes back and retrieves it before fleeing, leaving the Prince with nothing. Later, after the meeting the prince a second time, she intentionally leaves the glass slipper behind because this time, she wants him to find her. It’s interesting that something as small as intentionally leaving a shoe behind rather than losing it can change a character and a story so much, but it really does. The “Ella” in the 2013 Broadway production, which the current tour is based on, is more proactive and takes control of her own destiny. Her initial motivation for meeting the prince (before she falls for him, of course, because this is still based on a fairy tale) is to alert him to the plight of the poor citizens of the kingdom in hopes of inflicting social change. A modern protagonist who cares about social issues and isn’t solely focused on finding a man? Definitely not the Cinderella we remember from the Disney film, which I found to be quite refreshing and unexpected. Rodgers and Hammerstein’s Cinderella was first written for television in 1957 and starred Julie Andrews in the title role. In 2013, the show was brought to Broadway for the first time with a new book written by Douglas Carter Beane. While the 1957 version was presented in three acts, the new version was rearranged into two and several songs from other works in the Rodgers and Hammerstein catalog were added. Cinderella as a character became a little sassier, the subplot about her desire to alert the prince to social injustice in the kingdom was added, and one of the stepsisters was transformed into a sympathetic character and given a revolutionary love interest. Some basics of the classic fairy tale remain the same: Ella’s fairy godmother does transform her from rags to riches so she can attend the ball, and she does marry the prince at the end, but otherwise I was quite surprised by just how much the story has been updated to better connect to 21st century audiences. The current touring production stars Paige Faure as Cinderella, Andy Huntington Jones as the Prince, Fran Drescher as Madame, aka the evil stepmother (at the performance I attended, Madame was played by understudy Paige Williams), and Kecia Lewis as the fairy godmother. The entire cast, many of whom came straight from the Broadway production when it closed in January, was very talented and charming. The music runs the gamut from iconic (“In My Own Little Corner,” “The Prince is Giving a Ball”) to forgettable, but the production is sweet and spirited throughout. I was particularly impressed by Faure’s performance in the role originated for this version by Broadway darling Laura Osnes. Aside from having a beautiful soprano voice, she possessed a star quality that enabled her to easily carry the show. By far the most incredible moment of the production is when Cinderella’s dress is transformed by her fairy godmother (this happens again in act two). It was simply some of the most stunning stage magic I’ve ever seen, and the production clearly deserved its 2013 Tony Award for Best Costumes. We are frequently reminded that “impossible things are happening every day,” and this quick change, which happens in full view of the audience, is certainly one of them. Although I have been told the transformation was done differently for the Tony Awards performance, the video below should still give you an idea of just how impressive it is. I was intrigued by the choice to make one of the usually villainous stepsisters into a likable character. It lessened Cinderella’s plight a bit by giving her an ally at home (at one point, this stepsister, Gabrielle, even helps her sneak away to see the Prince) but also added some dimension to a previously flat character. The Prince, however, is probably the most underdeveloped character in the show. All we learn about him is that he is adept at slaying dragons, is oblivious to most of what’s happening in his own kingdom, and really likes Ella. But shows like Cinderella are not designed to be high art, they are designed to be an enjoyable escape that theatergoers of all ages can enjoy. I know I smiled throughout, as did the many young girls in princess dresses scattered throughout the theater. They got a very enjoyable afternoon, an introduction to live theater, and a version of Cinderella who is a way better role model than any other iteration I’ve seen, and all of that certainly means that this production has achieved something. 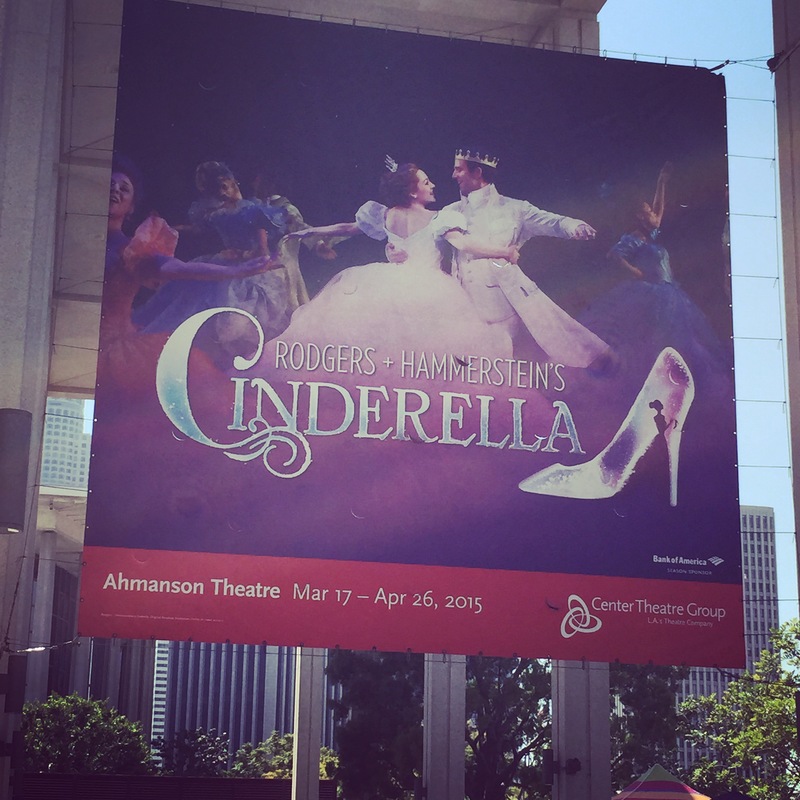 Cinderella plays at the Ahmanson through April 26th and tickets are available here. For more information on the production and upcoming tour dates, visit cinderellaonbroadway.com.